Trim eye fillet and cut into 200-gram medallions, cot a slot in the side of the medallion. Peel kiwifruit, slice and slide some pieces into the meat. Place on hot grill until cooked medium rare. Peel kiwifruit, cut in half. Mix together chopped pistachio nuts, onion, capsicum, avocado oil, parsley, salt and pepper and sprinkle onto kiwifruit. Bake in the oven for 10 minutes. Peel and finely slice evenly the gourmet potato, parekareka and kumara (using food processor slicing blade makes this easy) Using at least an 8 cm deep dish layer potato, kumara, onion and cheese, gently pour over the heated vegetable stock and cream. Cover with foil to speed up cooking process. Bake 180 C fan bake for 45mins to an hour. Cool then place in fridge with a heavy weight on top to compact it. Then taking a 7cm round cutter cut out rounds. Bake these in oven until golden. For the sauce heat in a saucepan kiwifruit, feijoa, blueberries, brown sugar and white wine for 10 minutes, puree thru a blender. 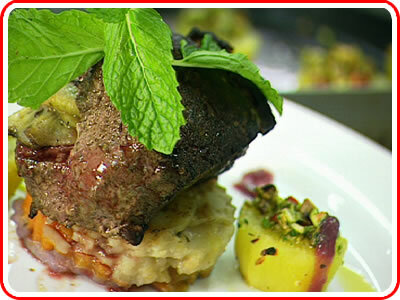 Place potato stack center of plate, arrange beef fillet ontop, baked kiwifruit and pistachio to the side, drizzle around the plate the fruit sauce and avocado oil, serve hot.